While all BBQ Grills ultimately cook with flame, the fuel source generating that flame drastically impacts the flavor and quality of the recipe. While propane, natural gas and charcoal can cook, each fuel source also has distinct disadvantages that prevent the full taste and flavor in a recipe from emerging. Flare-ups frequently occur in a charcoal grill. The flame is unpredictable, dancing up-and-down. When the flame touches the food in an uncontrolled and inconsistent manner, the food is charcoaled and burnt, degrading the flavor. Charcoal and gas simply can’t provide the flavor of real wood. Grilling with wood pellets penetrates the food with an intense, smoky flavor, sealing into the food and locking in natural moisture. When cooking with wood pellets, the fuel is consistent and the smoke more flavorful. Wood pellet grills are safer because there are no gas leaks, no dripping hot coals and no fuel flair-ups or explosions. Other methods of cooking can add calories and cholesterol to food. Other fuel sources are expensive to operate. A 20-pound bag of wood pellets can provide more than five times the cooking duration of a bag of charcoal. Wood pellets are convenient. Other fuel sources need to be constantly tended and monitored. With wood pellets, the grill can be set to the target temperature and then left unattended. Gas and charcoal are not as environmentally friendly as wood pellets. Charcoal and gas are oil-based and burn with residue. Wood pellets burn clean from renewable resources. Gas and charcoal lack versatility. A pellet grill is able to barbecue, grill, bake, roast, sear and smoke. Other fuel sources lack digital thermostat controls. The temperature is harder to set, monitor and control. Bark content in the pellets affects the BTU, so always use the same type of pellets when grilling in your pellet cooker. Performance quality is vital to good results! Use only 100% wood food-grade pellets in the PG500 and PG1000. 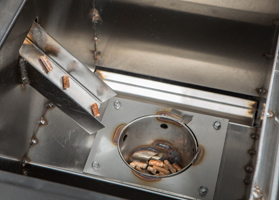 Barbecue pellets are made by pulverizing hardwood sawdust and extruding an uniform density through a rotating die under enormous heat and pressure (400° @ 10,000 PSI). Naturally occurring lignin in the wood binds the pellets into their shape. Pellets are easily obtainable, inexpensive and easy to store. Wood pellets are a superior cooking technology, providing the best cooking platform for barbecue recipes.